SAN DIEGO — For 40 years, scientists at sea have relied on the pier at Scripps’ Point Loma Wharf to safely and quickly load their vessels with hundreds of pounds of research equipment. But cracked concrete and exposed rebar has left users walking on eggshells the last five years,. 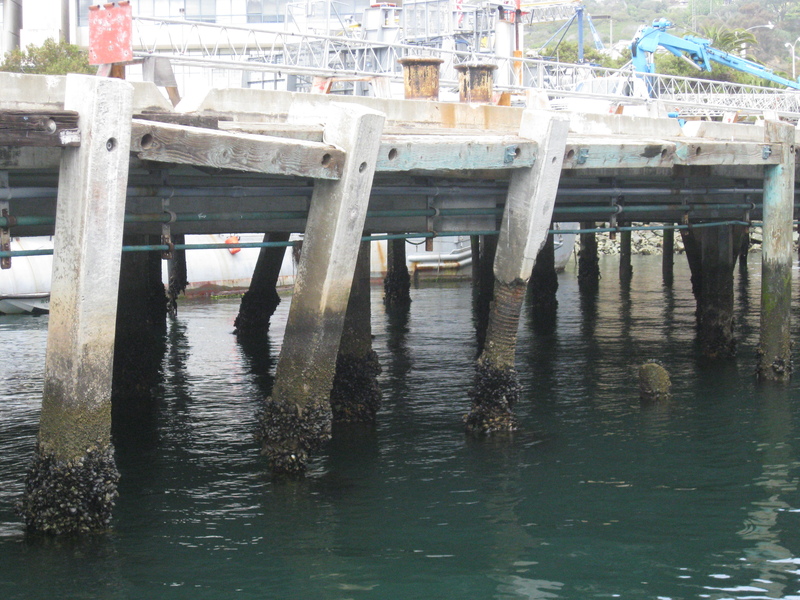 After Associate Director of Scripps Institution of Oceanography Ship Operations & Marine Technical Support Bruce Applegate discovered deterioration below the wharf and pier structures, Scripps hired an engineering firm to analyze the structures. “They found out we could only carry a load that was 20 percent of the weight it was designed to hold,” Applegate explained. The wharf, which was built in the mid ’60s, and the pier, which was built in the late ’70s, have reached the end of their engineering lifespan, Applegate said. Scripps now plans to rebuild and restore the structures to their former glory. “We’re going to remove the deck, supporting beams and pilings, and replace them so that when we’re finished what the facility will look like will be very much as it looks today just with restored functionality” he said. The proposed project would replace the existing Scripps Institution of Oceanography/UC San Diego Nimitz Marine Facility wharf and pier with a concrete-pile-supported structures of the same size and in the same location. The replacement pier would be approximately 365 feet long and 50 feet wide, totaling an area of 18,250 square feet. The wharf would be approximately 307 feet long and 31 feet wide, totaling 9,517 square feet. The pier will also have to be raised by 2 feet more than its current height in order to meet state guidelines on sea levels. “If we wanted to make it bigger there are additional permitting issues that would come up,” Applegate said. “We’re really satisfied with the way our facility has worked. They can’t put the pilings in the exact same place but it’s going to be pretty close.” While the current status of the pier and wharf isn’t dire, Applegate believes they caught the erosion at just the right time. “Our scientists bring all sorts of crazy stuff aboard — specialized systems for sampling seabeds, coring systems, dredges, large cylindrical metal cages, sampling bottles — these things are really big and really heavy, often weighing hundreds to 10s of hundreds of pounds,” Applegate said. But due to the wharf’s busy schedule and demand, vessels only ever have a day or two to get in and out. Scripps’ support facility has to work like clockwork. Unlike the hands of a clock, the wharf’s workers have been hobbling along, only able to get their work done using extreme measures. For the last four years, wharf workers have been unable to load vessels using the support facility’s cranes. They currently rent longer cranes that have the ability top to reach cross the platform to vessels from the wharf. Scripps is currently accepting bids from construction firms and expects to select a firm by April. Construction is scheduled to begin by June, and be completed in December 2015. Pile driving and other in-water demolition or construction that creates excessive underwater acoustics and turbidity will be put on hold from April 1 to September 15 in order to avoid disrupting the endangered California least tern breeding season. There won’t be any usable berths at the facility during the construction period, so Scripps will have to find a temporary home for its four ships — Roger Revelle, Melville, New Horizon and Robert Gordon Sproul — and the research platform FLIP (Floating Instrument Platform). Sally Ride, the school’s newest research vessel, will also be docked at Nimitz in 2015.